I’m in the middle of finals so I currently have the attention span of a 2 year old. Thus this post will be random- but what else is new? 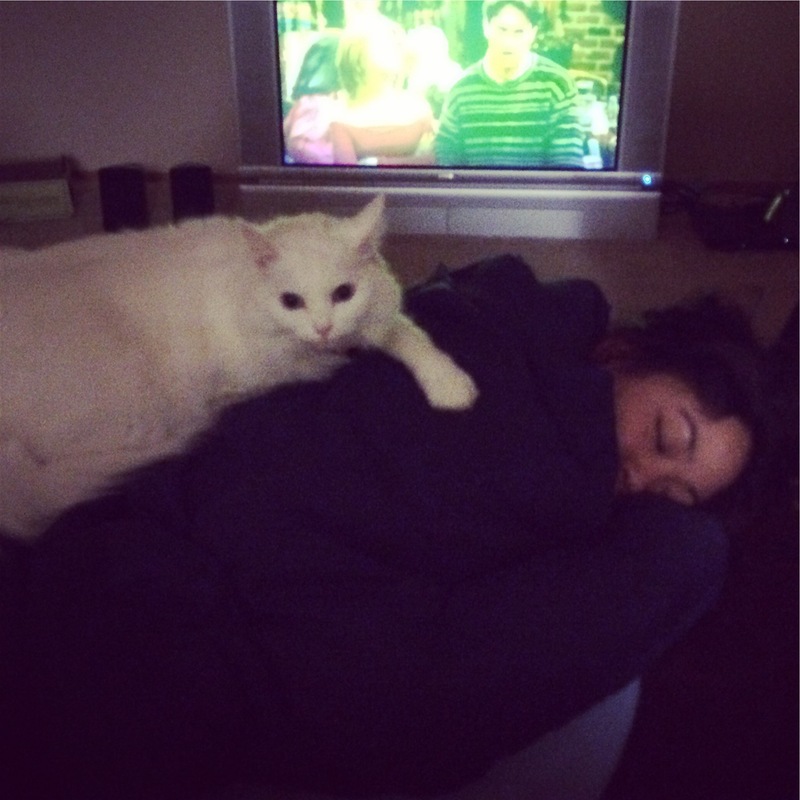 I fell asleep on the couch and Kyle snapped this at some point. I’m a heavy sleeper. Yes the TV is on the ground (I’m working on the stand). Yes that is Chandler Bing. 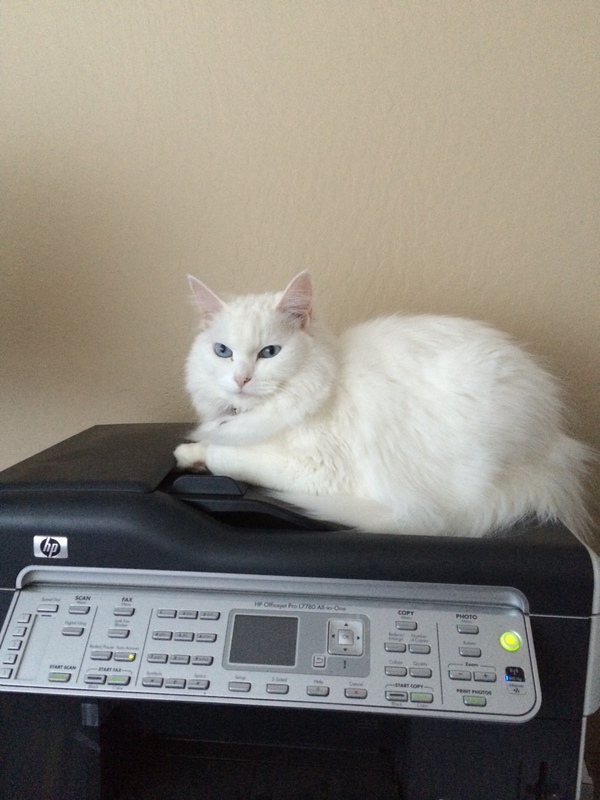 And here she is, on top of our printer. I’m sure she’s going to break it one day because she pounces on top. I took her off of it as soon as I snapped the photo- hopefully that doesn’t confuse her. Kind of like laughing while reprimanding a child. I’m banking on the fact that my sweet, beautiful kitty isn’t the sharpest tool in the shed. On to workouts this week, which have been thrown off due to exams. Since I took Tuesday off, I’ll try to make that up on Friday (Wednesday and Friday are my normal rest days). But we’ll see. I have an exam Friday and a Final during the weekend. Almost. Done. And my final tangent- Over the weekend we celebrated Kyle’s mama’s birthday! 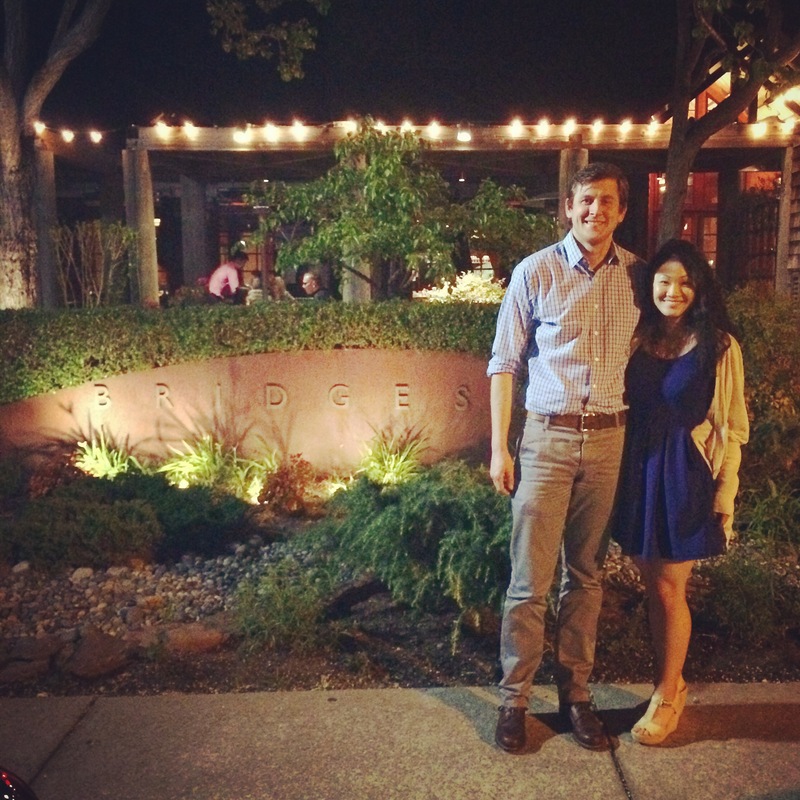 We went to Bridges Restaurant and Bar. Anyone remember that from Mrs. Doubtfire? What’s a weird place you’ve found your pet? Have you ever been to CorePower Yoga? Please tell me you’ve seen Mrs. Doubtfire! If not, you have homework. So cool! I am a big fan of CorePower Yoga. Have a great time. I wish I lived closer and could go. I could tell as soon as I started this that you feel asleep to Friends. Lately I have been all about catching these reruns. I have decided that if I must be on bed rest at some point I might just do a marathon of Friends. I love love love hot yoga and go whenever I get a chance (not the easiest when you work 12+ hour days and miss all the classes. Good luck on finals! Oh hypha- one of these days I’ll get around to ACTUALYLY consistently doing it. Good luck on your finals! That’s so crazy you’re already in finals!! every picture of you and kyle looks like it came straight from a magazine! I love yoga! I know you guys will have a blast when you go (always more fun with friends, right?). YUS~ Mrs. Doubtfire was my favorite moving growing up (outside of the animated Disney classics, of course).